A promotion within Roccor is aimed to assist with the company's plans for rapid expansion in aerospace and defense with solar array, RF antenna and deo-orbit, and custom deployable and thermal management product lines. This Colorado-based company is a disruptive military and aerospace component supplier in the rapidly growing small satellite market, and the promotion of Heather Shoffner to chief operations officer is a result of their quest to maintain product excellence and customer satisfaction. Shoffner, who joined Roccor in December of 2018, is a leader with more than 20 years of experience in attracting, hiring, and developing talented individuals to participate in dynamic teams throughout the operations organization in a variety of industries and environments. 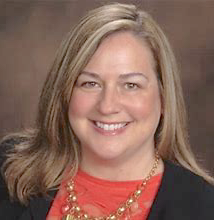 As Roccor’s COO, Shoffner, a graduate of Northern Illinois University and a Certified Supply Chain Professional, will lead her team in the introduction of an Enterprise Resource Planning platform and create a visual manufacturing environment for the company. Heather said that her goal as chief operations officer is to provide the scaffolding, the support structure, that allows their team of engineers to do what they do best: conceive of, design, develop, and ultimately launch new products that are changing and commercializing aerospace. Operations for Space 2.0 is about striking the right balance of lean manufacturing and creativity, and about focusing on process improvements that establish efficiencies and good practices that elevate and allow for innovation. She added that as a woman in STEM, she is excited to be working with so many talented, professional women in key roles at Roccor, including engineering, quality, project management, human resources, and finance. Before joining Roccor, Shoffner worked for a number of Colorado-based startups, including positions as director of operations and as supply chain manager at Honeybee Robotics, as materials manager at Zolo Technologies, and as materials manager at PrimeStar Solar. Chris Pearson, CEO of Roccor added that Heather’s superpower is that she brings a high emotional quotient and a unique combination of both technical and interpersonal skills that differentiates her. They sought out her deep supply chain knowledge and start-up experience that matches how Roccor has evolved from early stage to high-growth.